I believe this was taken along the front range, Colorado. Ilford FP4 Plus. The lone tree on the hill top makes a fine subject with the grasses in the foreground. Nice shading around the edges. Simply beautiful shot. Love the starkness and (as you mention) loneliness of it. Great choice to go with monochrome. really lovely. quite like the grain. this is so appealing. Partly because I am so drawn to black and white but moreso because of the keen eye in composition and the gentle simplicity. 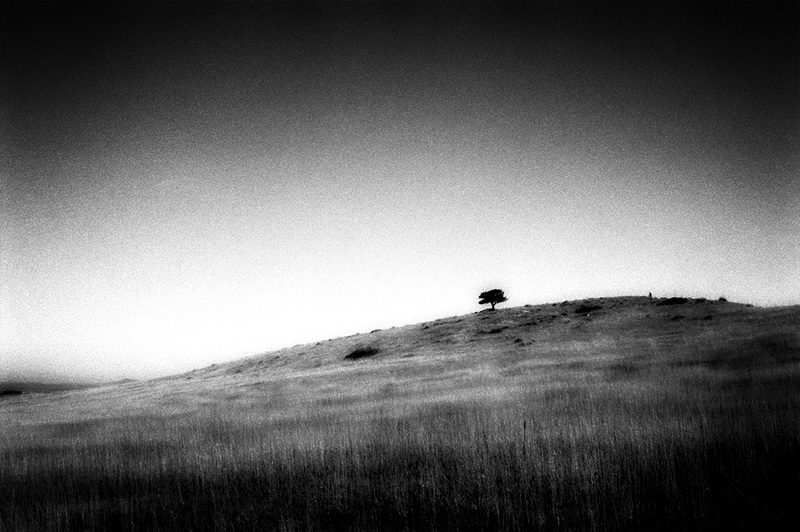 A hill to lose oneself like this lonely tree. A minimalistic picture (though it may be the result of a delicate post-processing), and a masterpiece for all the feelings it evokes. Such a simple and stark image, done so well. This is great – the light on the grass in the foreground is the perfect counterpart for the lone tree on the skyline. Amazing photograph and all the more so from film. Lovely grain and texture in this shot! the dark/light gradations throughout this are so beautiful. finds like this are certainly incentive to organize. Composition is fabulous, this image has such a stark beauty about it. And you did it with film. Bravo. You know what they say, it is lonely at the top. Very nice, I like the graining and the B/W processing. It works great with a subject like this. Wonderful simplicity! Love the composition…the mood you've captured/created. Classic landscape with some really cool post processing. Love the simple lines. Great vision to create such a strong image from such simple elements. Nicely done. Yes it is lonely at the top. Race you to the tree. Wonderful photo! I'm a big fan of lone tree images, wonderful mood to this one!! …just like coming straight out of a dream. That's an amazing photograph! I love the composition and your use of grain, it gives so much texture to the image. I love this kind of scenery is beautiful !